Couplers have been in continual use in trains from the early 19th century to contemporary times. A modern freight train can include more than one-hundred cars and be over a mile long. Couplers hold the cars together, from the first tug of the engine, as its force overcomes the inertia of each car, to the end of the train. A coupler requires extraordinary strength and flexibility to maintain its hold over hills and dips, around curves, and over rough track. In 1863, when the Union Pacific and the Central Pacific Railroads were breaking ground, the most common coupler in use was the "link-and-pin" ("Lincoln pin"). This was a simple, elongated iron loop that was fitted into an opening at the end of each car's drawbar. The loop was anchored in place by an iron pin dropped through a socket in the top of the drawbar. The pin passed through the link and through another socket in the bottom of the drawbar. The link-and-pin construction was inexpensive to manufacture, making it the predominant coupler in use until the 1870s. 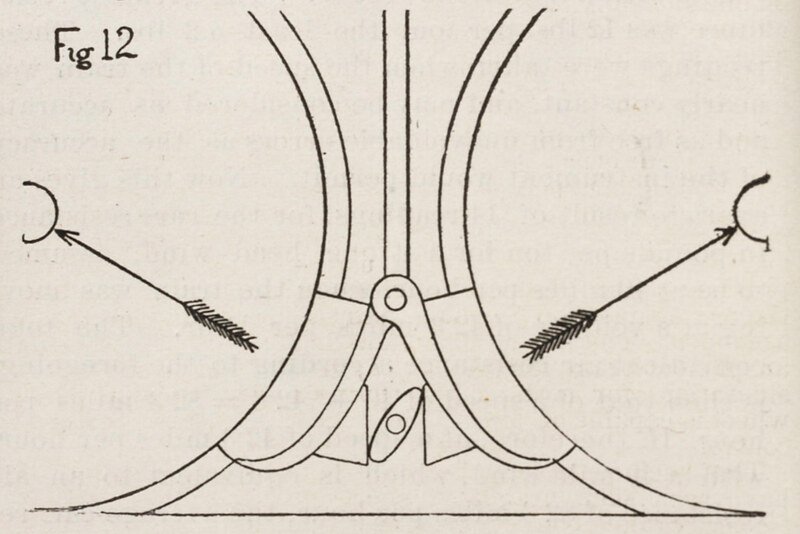 However, the link-and-pin, as well as other early railroad couplers, had disadvantages that became more problematic with the expansion of railroad systems, the increase in locomotive power, and train length. Excessive slack between cars ensured a jarring, uncomfortable ride that could harm passengers and cargo when a loosely-coupled train pulled out of a dead stop and each car started forward with a violent lurch. In 1863, Ezra Miller successfully patented and marketed the first model of his coupling device that became known as the "Miller Hook" or "Miller Platform." The Miller Platform eliminated slack between the cars and included a shock-absorbing spring and a buffering platform that prevented damage from cars' bumping into one another during sudden stops. Because of its high cost, the Miller Platform was used on passenger trains, while freight trains continued to use the link-and-pin couplers. Plan view of Ezra Miller's coupler as applied to the bottom of adjoining rail cars. The link-and-pin was also slow and inefficient to operate, requiring a worker to stand between the cars and effect every coupling and uncoupling. The switchman, also called "brakeman," who worked in the yard with the link-and-pin coupler had a dangerous job. Crushing accidents were common. Mangled hands and missing fingers were the badge of the experienced worker. Standing between cars as they were being pushed together and holding the iron link up to guide it into place, working around the "dead wood" buffers that kept the cars from telescoping together, the switchman would only need a moment of lapsed attentiveness to lose a finger, a hand, or his life. In 1879, Eli Janney, a shop clerk and skilled whittler, patented his first coupler design. 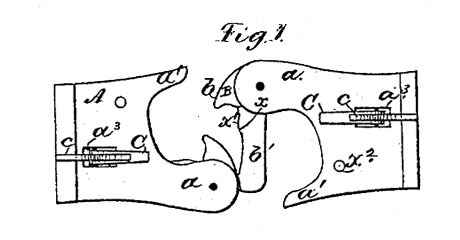 He whittled a wooden model of his "knuckle" coupler and commissioned a draftsman to make a drawing of it for his patent application. With a few subsequent revisions, Janney's coupler, which resembles two hands with fingertips hooked together, solved more than the safety problem. The Janney coupler automatically engaged without the need for a man to stand between the cars. It held train cars without slack, enabling smoother acceleration and more efficiency around curves, but with enough play to secure the train over hills. It also functioned as a buffer, preventing damage to passengers and cargo. 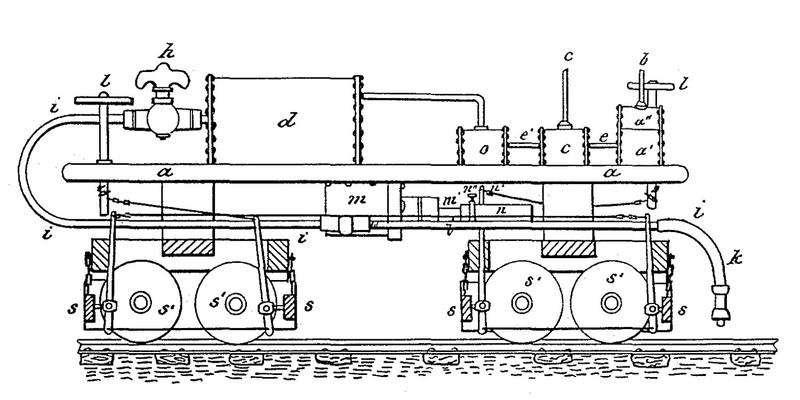 Patent diagram of the Janney coupler. 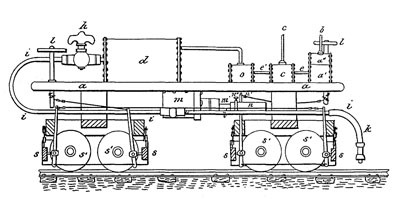 After testing and comparing the performance of many coupler designs, in 1888 the Master Car Builders Association received a partial waiver of patent rights over the Janney-style coupler. The Janney-style coupler became the standard for U.S. railroad cars. 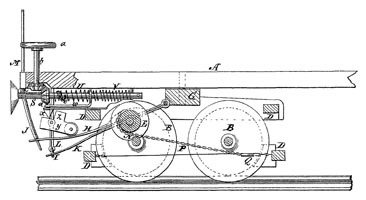 Early methods of stopping trains included reversing the locomotive engine and the use of wheel braking systems that were limited to the locomotive and its tender. During the 1860s, railway brakes were manually-operated by the brakeman, who applied or released them by turning a handwheel that was positioned at the end of the car. By the late 1880s, passenger trains were running as fast as fifty and sixty miles per hour. Rail lines, once local and isolated, had become interconnected so that freight cars could carry their goods across the country by being hitched to a succession of different trains with compatible coupling and braking systems. 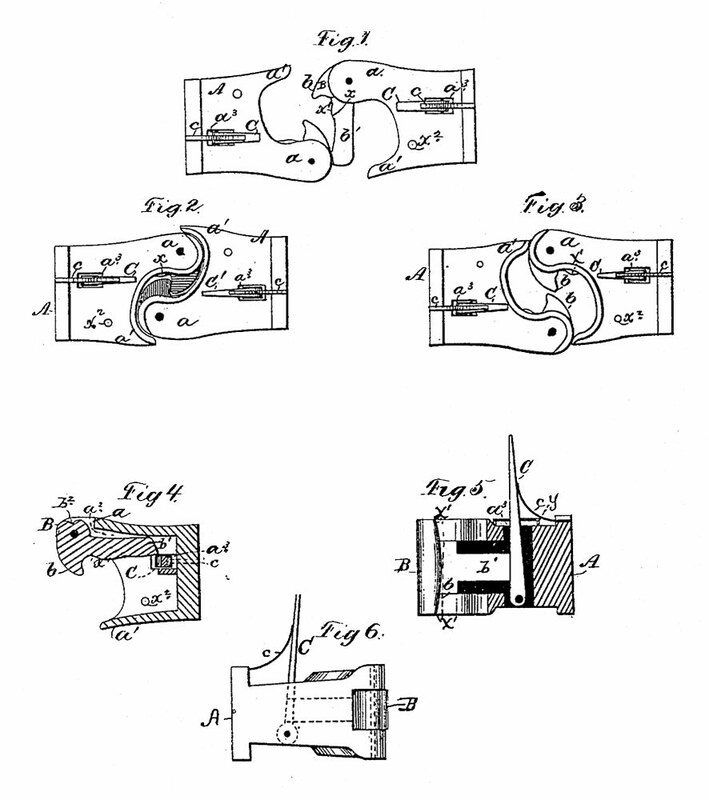 Various patents for brake improvements featured apparatuses for linking the brakes between the cars and employed different methods for reducing slack in the brake line. These innovations made it possible for trains to become longer and to carry more cargo, as heavier trains require more stopping power. 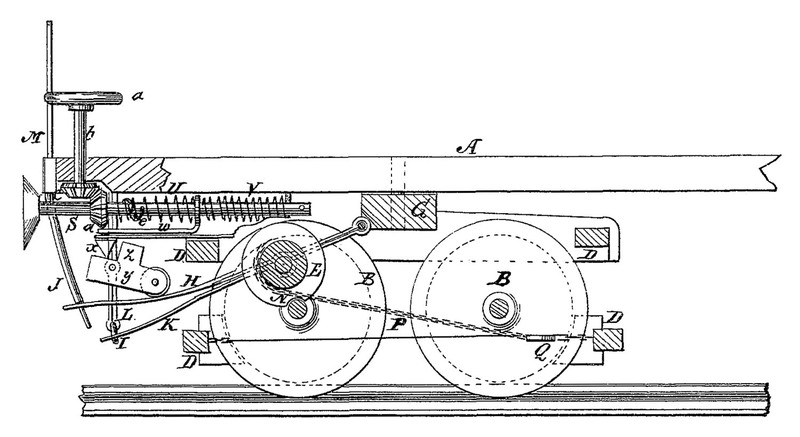 The most successful of the early continuous brakes used a chain link running through the length of the train that connected to a single control. 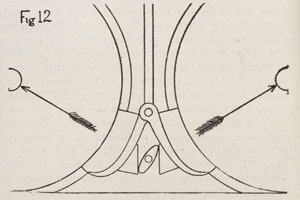 Diagram for an automatic brake patented by Luther Adams in 1873. A steam brake patented in 1853 was recognized by later generations of engineers as a hazard from the past. As the use of railways increased, the need for "automatic" brakes, which would engage in cases of accidental car uncoupling, grew more urgent. Railroad engineers grew quite inventive because of the proliferation of rail crashes involving cars that detached and ran downhill. Even a few chain brakes were designed to engage in cases like this, the tension in the chain functioning to keep a brake lever disengaged. Steam brakes were among the early power brakes. Used on locomotives and their tenders, they had dual disadvantages: steam lost pressure as it cooled and the hoses carrying the steam would freeze up and clog with ice in cold climates. Steam pipes were not alone in their vulnerability to ice; it could handicap chain brakes as well. Patent illustration for George Westinghouse's first patent for an air-brake. Contemporary freight trains employ air brakes that use compressed air to keep a car's brakes disengaged. When air pressure drops in a car's reservoir the brakes apply automatically. George Westinghouse patented his first air brake in 1869. He had difficulty persuading railroad officials that air could stop a train, but the efficiency of his system convinced detractors, and, by 1880, the Westinghouse automatic air brake had been installed on 2,211 locomotives and 7,224 cars in the United States. It was also used on rail locomotives and cars in Europe and Australia. The efforts of the Master Car Builders Association to standardize brakes, couplers, and car design, and the Safety Appliance Act of 1893, brought U.S. railroads into modern times. The Act mandated that all rail lines conducting interstate commerce must use cars that coupled and uncoupled without manual assistance of a worker standing between cars. The Act also required that the trains employ power braking systems that could control the speed of the train without a brakeman to do so manually. A seven-year grace period allowed railway companies time to comply with the new law. The effect of the changes was marked by the dramatic reduction of injury and death to brakemen.